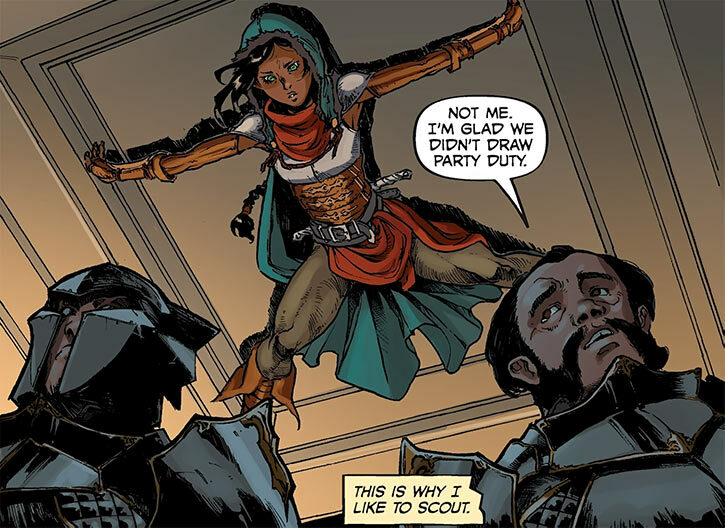 Vaea appears in the comic book miniseries Dragon Age: Knight Errant. This profile is intended to be read after the profile for Ser Aaron Hawthorne. Which is itself intended to be read after our primer to the Dragon Age milieu, unless you’re already an expert. 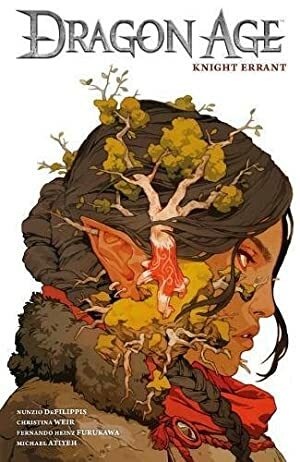 Reading the first Alamen Tabris character profile can also help, this time with material about Elves in the DA setting. 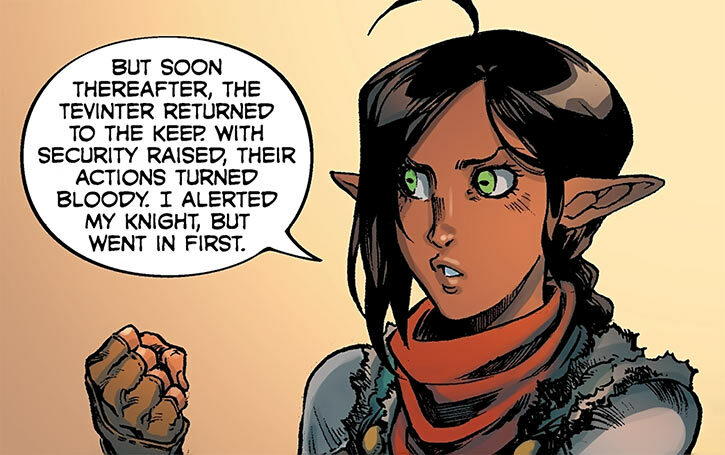 This has S P O I L E R S therein for Dragon Age: Knight Errant, Dragon Age II and Dragon Age: Inquisition. Other Aliases: “Fingers” (nickname from Varric Tethras), “Da’len” (common address by her uncle, but this just means “child” in Elvish). Known Relatives: Parents (deceased), Coran (uncle, deceased). Group Affiliation: Field Partner of Ser Hawthorne, “associate” of the Inquisition. Height: 5’1″ Weight: 95 lbs. Eyes: Big, bright green Hair: Jet black. Vaea is an excellent thief, stealth expert, climber, and acrobat. 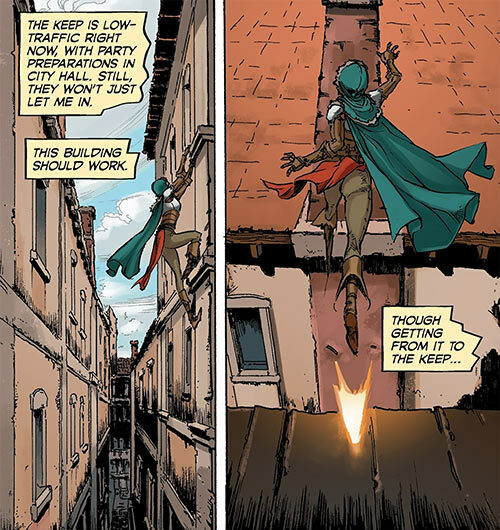 Her urban acrobatics are very Assassin’s Creed. She’ll often use her ability to scale buildings and jump across alleys to invade target sites from elevated, unexpected angles. Her low mass also allows her to land discreetly, or on some flimsy surfaces. Acrobatics are also used for evasion. One clever example was moving along the *outside* of a building by rapidly leaping from window sill to window sill and using gutters and faint handholds. She thus completely bypassed guards who were locking down the corridors within. She can penetrate strong security, but this requires a realistic amount of time to scout the place, draw maps, time the patrols, etc.. This can easily take days (well, nights) of reconnaissance and taking notes. She considers her lock-picking skills to be her weaker asset. Vaea nevertheless can defeat stout locks in a short time, but presumably will be stymied by the most expensive and secure sorts of lock. On the other hand, her pick-pocketing and cut-pursing skills are superb. A common tactic of hers to evade opposition is swiftly climb up a wall when out of sight. Then she hides alongside the ceiling or other elevated structures. Most people will simply pass underneath her, wondering how she disappeared. Vaea isn’t really a fighter. And with her low mass fighting unskilled would avail her little. She packs but a pair of small, curved daggers. However, she has training in using those to parry heavier weapons and fight defensively until she can break contact. She has a few bits of armour (shoulders, forearms and possibly abdomen) to facilitate such deflection. She can also sometimes use her long legs to trip or kick back a heavier opponent. Her long limbs and low mass further give her a surprising amount of pull-up power, so she can climb faster than you’d expect to evade opponents. She’s also good at conking people out from behind with a random hard object. The lass is a sharp, streetwise and resourceful one. Her plans are good, she’s skilled at deception, and she improvises well under pressure. Born in 9:23, the Elf Vaea grew up in the alienage of the city of Edgehall, in Western Ferelden. It was a small and miserable one, at the mercy of the oft-hateful Human rulers of the city. About the only good thing was that it was allowed to receive free “Dalish” Elves. At least one Dalish traded with and helped their alienage brethren. During the Fifth Blight, the alienage was gravely threatened by monsters. Not long after the Blight, in 9:32, there was a riot that was brutally suppressed, orphaning Vaea. Despite being but a child, she became a cutpurse to survive. Little Vaea also received help from her uncle Coran. Coran had left years before to join the free, “Dalish” Elves. After his niece was orphaned, he made a point to be a part of every Dalish party visiting the Edgehall alienage. Uncle Coran may have been the reason why the nomads didn’t snub the alienage Elves. Coran would buy the jewellery and other valuables Vaea stole. A tween could hardly be expected to deal with shemlen (Human) fences, and the alienage was too small to have its own. But the nomadic Coran could simply resell the goods in a different town. On his next visit to Edgehall, he would then give Vaea the money. Coran also taught Vaea not to lose herself in bitterness and racism. Though he did not consider that stealing from rich shemlen was wrong, he convinced her that some Humans were alright. He taught Vaea not to judge them based on their species alone. But he also taught her not to get involved with Human causes, for her own safety. Coran repeatedly invited Vaea to come join the Dalish. But the girl always turned this down, clinging to the only home and life she knew. In 9:36, another dispute arose about repairing the flimsy walls protecting the alienage. The lord of Edgehall ordered an odiously brutal response, and his guards burned the vhenadahl. A vhenadahl is the sacred, communal tree at the heart of an alienage. Dalish Elves came in. Coran brought a suitable sapling. His plan was to convince the alienage to calm down, and plant a new vhenadahl for the community using Dalish rites. But everyone was furious. Even though she was just 14, Vaea stridently advocated for violence. Then things got even worse when Humans confiscated the prepared sapling. Violence was at that point inevitable despite Coran’s efforts. Vaea sneaked into Edgehall, and used her superlative thieving skills to repossess the Dalish sapling. When she came back, the alienage was burning. Like with the riot in 9:32, the 9:36 revolt was a bloody one. But this time the Dalish visitors had fought along with the alienage Elves, considerably increasing the fatalities on both sides. Coran was among the dead. Things would have gotten even worse were it not for a Human visitor. Ser Aaron Hawthorne bravely interposed himself between rioters and guards. He pleaded for peace, and somehow managed to break the spiral. He then negotiated a deal with the lord of Edgehall. The Elves were jubilant over Hawthorne saving their lives and the alienage. Despite having nothing they threw a feast for him. Then they proceeded with the planting ceremony for the sapling Vaea had repossessed. 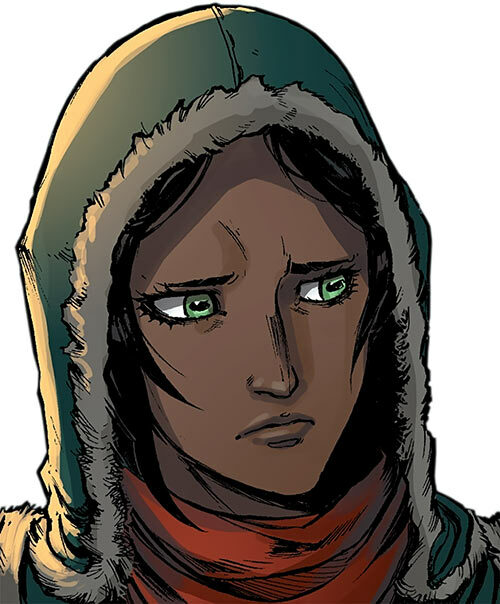 However, Vaea was far too distraught — over the death of her uncle, her role in the uprising, and having been away during the battle — to participate. Ser Aaron noticed Vaea, and determined that she was the one who had recovered the sapling. Touched by the destitute Elves’ generosity, he repaid them by inviting the talented Vaea to become his squire. An Elf serving as squire to a Knight of Ferelden was practically unheard of. Vaea was defensive and distrustful. But Aaron pointed out that he was just an old man travelling from city to city as a goodwill ambassador. As such, he wasn’t going to involve her in Human wars or causes. Now wanting to leave, Vaea took his offer and became Squire Vaea. The bereaved Vaea distrusted Aaron as a shem. For years, she considered that he was just her meal ticket. Still, he was nice enough and being his squire wasn’t a bad job. But mostly, he was a great cover to steal valuables from rich shemlen, give them to the poor in the local alienage, and promptly move on. Which is exactly what Vaea continued to do until 9:44. 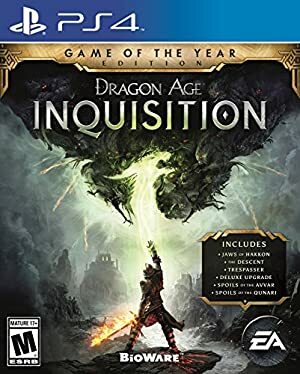 Whether Ser Aaron and Squire Vaea were affected by the major crisis chronicled in Dragon Age: Inquisition is unaddressed. By 9:44, Ser Hawthorn was visiting Kirkwall, in the Free Marches. There he became a friend of Viscount Varric Tethras of Kirkwall. Varric was a… colourful and charismatic figure, a lover of tales such as Aaron’s, a successful dime novelist, and ridiculously well-connected. Meanwhile, Vaea focused on her real work. An ex-Templar hired her to “repossess” a hidden box full of valuables from the Gallows, a fortress near Kirkwall. She did the job, but then betrayed her employer. As usual, her goal all along had been to hand over the entire jackpot to the local alienage. As Vaea was leaving the now-somewhat-less-impoverished alienage, a smirking Elf woman came in. She clearly knew everything about Vaea’s latest caper. With a sinking feeling, Vaea learned that this woman worked for the Inquisition. Worse, she was a senior officer for the Inquisition. Worse still she was Charter, one of the most dreaded assassins and spymasters working for Sister Nightingale. Charter needed an expert thief to rescue two of her agents, who had been imprisoned in Starkhaven. She had specifically selected Vaea since the kid never killed. That was a big plus since the prince of Starkhaven was an Inquisition ally. But Vaea refused, not wanting to get involved in any outside cause. Charter then announced that she wouldn’t help with Vaea’s Templar problem. Sure enough, the ex-Templar that Vaea had just double-crossed over the hidden box soon found her, and almost killed her. Soon after, Vaea learned that Ser Hawthorne had received an invitation to Starkhaven hours ago, and that they would promptly get there. That Varric, who had served as a close ally of Inquisitrix Agathe de Fer-de-Sixt-d’Orlac, was still working with the Inquisition. That he and the Inquisition knew everything about Vaea’s nocturnal activity. That they saw her as a strong potential and the best asset to free their imprisoned agents. And wouldn’t let go. The Inquisition never lets go of anything. That Vaea had no choice but to take the job. Varric handed Vaea full plans of the Starkhaven’s Prince’s keep, including the dungeons. With this invaluable resource Vaea could quickly get in and start mapping and timing the patrols. She hoped to do that one job and be left alone, though it was clearly a pipe dream. Despite the heavy patrols, Vaea did get the two Inquisition operatives out. The duo, Tessa (Tessarey Forsythia) and Marius, were usually called the Mage-Killers. Tessa explained that the original mission was to retire a book about lyrium, since the secrets it held posed a grave danger. Meanwhile, Ser Aaron nearly came to fisticuffs with another guest at the party. Professeur Cédric Marquette of the Université d’Orlais was a tomb raider, which Hawthorne despised. Furthermore, Ser Aaron could sense that he was up to something. As Vaea put the Mage-Killers aboard Varric’s carriage to exfiltrate them, she dismayedly realised that she felt compelled to complete their mission. She had seen in Kirkwall a sample of the horrors that red lyrium can wreak, and she was just the person to make the book vanish. At this point, Vaea realised that Professeur Marquette was acting as a mercenary. He had been sent to recover the book about lyrium, and had brought Tevinter mercenaries with him. Marquette’s party went for a brute force approach, attacking the keep from within to grab the book and get out. Vaea got in before Marquette did, but was intercepted by the Starkhaven castellan. Ser Aaron then came in, knocking the castellan out. Caught red-handed, Vaea thought that her squire gig was over. But Hawthorne laughed, telling her he had always known of her activities. In fact he approved of them. That she stole from the rich to give to the poor, without harming anyone, was fine by him. At this point, the Tevinter mercenaries and Marquette barged in, cornering them. But Vaea was in for another shock. Ser Aaron, whom she had thought for years was just a pathetic, washed up wreck, fought like a tiger. He beat the enemy back by himself. At his command Vaea fled from the fight, intercepted Marquette, knocked him out and stole the book back. Wait, wait, there’s a perfectly reasonable explanation for this ! After dispatching the mercenaries, Ser Aaron was found by Starkhaven forces. He surrendered, and started taking the fall for his squire. He did so by explaining that she had done it all on his order. But Vaea then came in. She bullshitted a story that was *almost* true. Vaea stated that she and Ser Aaron were elite agents of Ferelden who had been watching the suspicious Marquette. In Vaea’s story, she had observed the Tevinter mercenaries getting into the dungeons, but had been told not to intervene yet. Then she and Aaron had come in once they could catch Marquette red-handed and prove their accusations. Since Aaron had clearly stopped the mercenaries, and Vaea had undeniably captured Marquette, this story made sense. The escaped Mage-Killers were blamed on the Tevinters. Vaea said that the book had likely been taken away by those mercenaries who escaped. There were discrepancies in her account. But the Prince of Starkhaven was rather taken with Vaea, and more likely to believe her lies than Marquette’s. Also, Squire Vaea and Ser Aaron made sure to leave PDQ. Charter and Varric came to recover the tome about lyrium. Vaea had glanced through it, and learned that a piece of red lyrium *already* was in Tevinter. This posed a grave danger, even if Tevinter lacked access to the secrets in the book. By this point Vaea had made her choice. She offered to go to Tevinter as an Inquisition agent. This pleased Ser Aaron, who wished to continue working with his Squire. Charter took the deal, dispatching her two brand-new operatives to Tevinter. Though they would maintain the Knight/Squire cover, Ser Aaron said that he now considered Vaea his field partner. The first thing Vaea did now that she no longer was an underling was to grab Aaron’s wineskin and throw it away. That started his travails to break the hold of alcoholism. As an Elf, Vaea is small and with pointed ears. Hers stick out from the sides of her head – some other Elves have their ears stick closer to their skull, but there’s a lot of variance in angles. She has brown skin, raven hair and a Mediterranean-style, hawk-like nose. 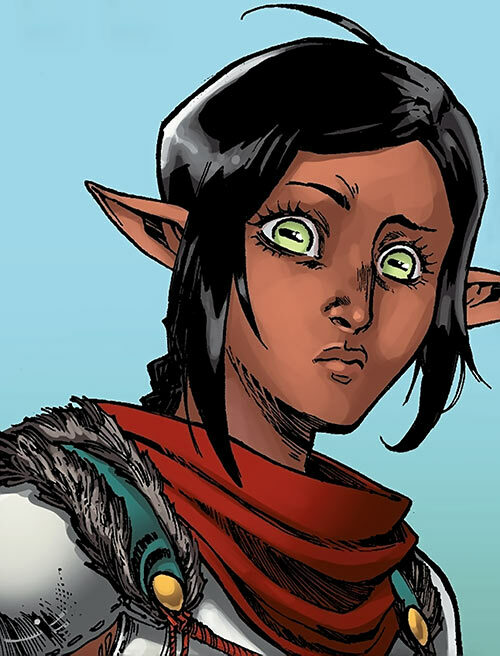 Elves have a wider range of eye colours than Humans, and this is evident in Vaea. She has huge eyes of a much brighter green than a Human could. The exact shape of her pupils also seem to vary along with her emotions. It could be manga -style exaggeration, but then Elven eyes can be weird. Vaea is fit, slim and with gigantic legs (well, proportionally). The latter are useful in her running and acrobatics. A lock of her hair defiantly stands up atop her head, being apparently unflattenable. She’s a pretty one. Not striking or anything, and her features are too sharp for many’s tastes. But her looks have gotten her into or out of trouble on a handful of occasions. Vaea always wear a cloak with a hood, which she can use to conceal her hair and ears. There’s also a neckerchief she can use to conceal her lower face. However, the eyes remain distinctive and can’t be hidden. 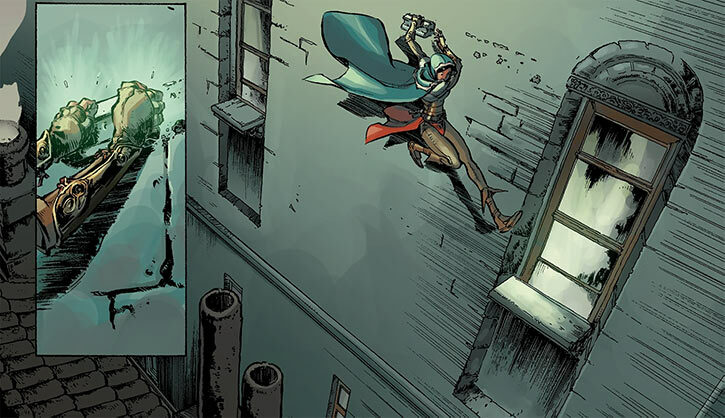 Vaea is a sharp, professional thief and acrobat. She plans ahead intelligently, stays collected and is goal-oriented. Most of the time she will play her role as a deferential, humble squire. She doesn’t say much and acts more like a servant. Howbeit she can’t quite conceal her pride. She will appear to ignore racist insults, but will brook and correct people who address her as a servant rather than a squire. Which happens a fair bit. Vaea is an alienage justice activist. She’ll gleefully steal from rich, pompous Humans to give to the needy families of the nearest alienage. This is her mission in life. She’ll sometimes keep some of what she steals for herself, but one deduces that it’s just what she needs to buy her B&E supplies, pay Elven helpers (such as lookouts), etc. Vaea never kills. Or even leaves her enemies to die, even in an accident. She doesn’t seem interested in any sort of relationship at this stage, or perhaps at all. Her life as a squire has in fact been a lonely and transient one. Though she didn’t mind, that made the emotions of thankful Elves receiving her gifts even more meaningful for Vaea. However, by the close of the story, Squire Vaea and Ser Aaron have become good friends, and treat each other as equals. Vaea seems uncomfortable if somebody shows a romantic interest in her. Or when other people’s love life affects her, or with romantic stuff in general. She seems to enjoy travelling. And of course being constantly on the move quite facilitates her covert activities. Originally, Vaea is strictly apolitical. Her only cause is to stick it to cruel shemlen and support impoverished city elves. Due to her bad childhood memories, she refuses to take part in any war, struggle or cause greater than herself. However, exposure to Ser Aaron’s many tales of heroism, and to the courage of Inquisition agents, eventually changes this. She agrees to use her skills for the greater good, to Ser Aaron’s satisfaction, by working for the Inquisition. Vaea has a good sense of humour and repartee. She’s no comedian, but her dialogue has some nice funny bits – in the Dragon Age companions bants style. But she’s also angry, disliking prejudiced and/or wealthy Humans and frequently having to swallow racist crap while she keeps blandly smiling. In her heart, she is a rash one who wants to take action. However, she was lastingly shocked by the consequences of that when she was 14. As a result, she is very cautious about this side of herself – cut once, measure twice. She’s also wary about endangering others through her activities. Furthermore, Vaea was marked by Coran’s description of Elves. He described how Humans were ambitiously struggling and fighting to change things – often for the worse. In contrast, Coran saw free Elves as accepting the world as it is and having but the lightest footprint. However, Vaea eventually comes to accept that she had a greater role to play. Seeing the resolve of Tessa the Mage-Killer in protecting the world shamed Vaea, as did Ser Aaron’s knightly behaviour and valour. Vaea also gains a sense of what the Inquisition is fighting against, particularly after she saw the eerie remains of Meredith Stannard in Kirkwall. Ultra-vision only to compensate for low light. Martial Artist (EV) only when she can wield some hard object of opportunity to hit her target. In many cases, the object will further add to her EV. Misc. : Vaea is a squire of Ferelden, albeit to a landless knight (this considerably raises her social status, which is normally very low for Elves). Varric Tethras (Low), Ser Aaron Hawthorne (High), Alienage street (Low). SIA toward sparing her opponents, Secret ID, Misc. : Vaea is an Elf and suffers from Human prejudice, Misc. : body mass is 1 AP. Small but surprisingly tough daggers (x2) [BODY 04, Enhance (EV): 01 (cap is 04), Descriptor: Piercing]. Lockpicks, other small and concealable (or disposable) B&E gear, clothing and cloak with discreet pockets, stealthy and grippy shoes, tough fingerless leather gloves, forearm protectors. A good but not exceptional horse. Vaea *might* have Security Systems (to deal with low-tech systems, obvs). But there’s no evidence of this in the material, and she seems largely (or even exclusively) self-taught. In odd cases where she’s dealing with a mechanism she likely encountered before, you can use her Locks & Safes APs to represent fine mechanical disarming. At some points I had the impression she has a keen (but not superhuman) night vision. It’s too vague in the material, *but*, we know from the novels that Elves do have low-light vision. So after some hesitation it’s in her stats. 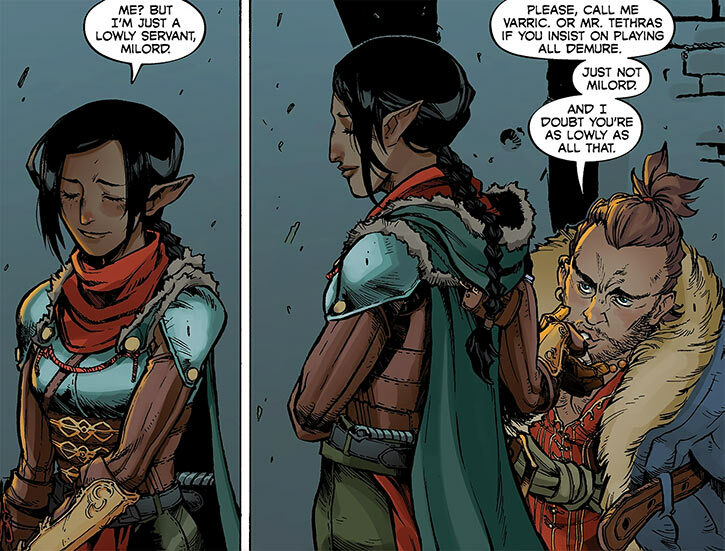 Source of Character: Dragon Age: Knight Errant comic books miniseries. Writeup completed on the 8th of December, 2017.